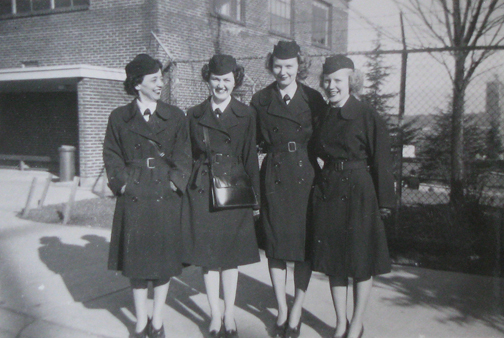 Jean Clark was stationed at NAS Lake Washington for the duration of the war. The facility is no longer a Naval Air Station, but is a public park. It’s located in Seattle, along the shores of the lake near the University of Washington’s Seattle campus. Jean was in charge of the Link Trainer Instructors. I think probably because I was one of the first ones there. I had a little more training than, I guess, well I had been retained for instructor, too, there. So the commander decided I was going to be in charge of the whole group. We didn’t have that many at first, only four. But then we increased to nine. We had a full complement of all we could use. By that time, when we had nine, we were pretty loaded with personnel. We were all good friends. All nine of us, still, went out to Seattle when we had liberty and we also after we were discharged, I was the first one to be discharged, we were writing letter. I think we wrote letters for 35 years probably. They came maybe twice a year. We called them a round robin letter. They were sent to the next person you know and we had a mailing list that you followed. It’s interesting. I used to keep all these letters, but I don’t have them any more. The photograph comes from the collection of Jean Clark.